1) A cot. We decided on a cot bed because we have the space and hopefully it will be slightly future proof. We bought the East Coast Angelina Cot Bed in pure white (see my review). It was on offer and part of Tesco clubcard boost so a bargain. It also got excellent reviews. By all means buy second-hand but you must buy a new mattress for each baby. 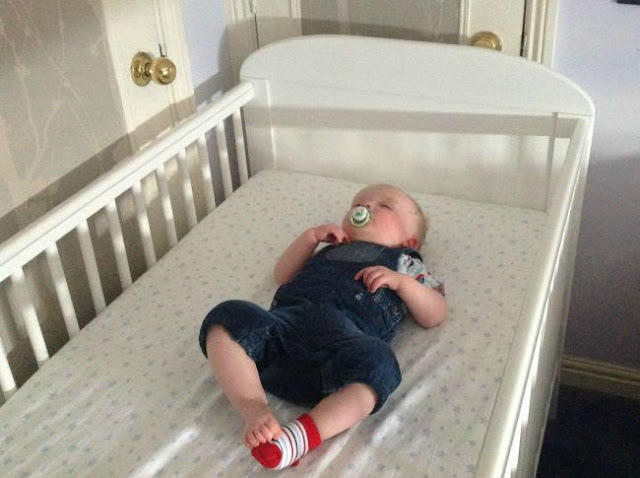 The Lullaby Trust has lots of useful info on safe sleeping. 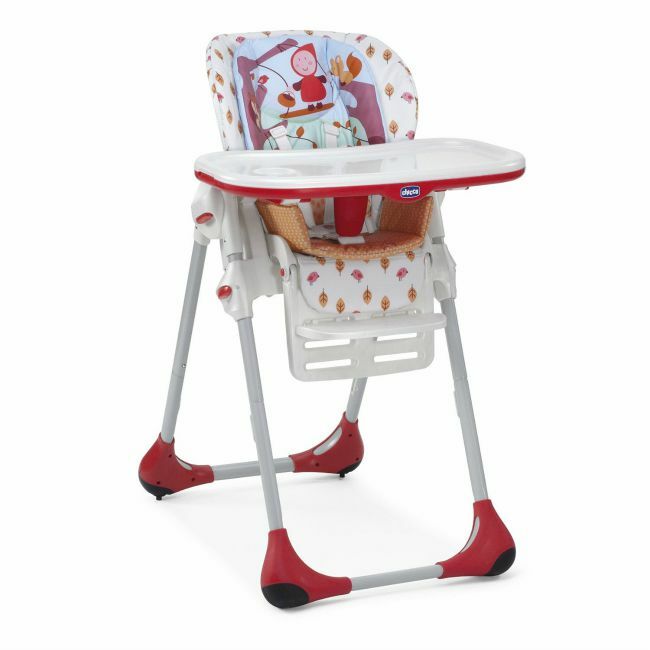 2) A high chair. 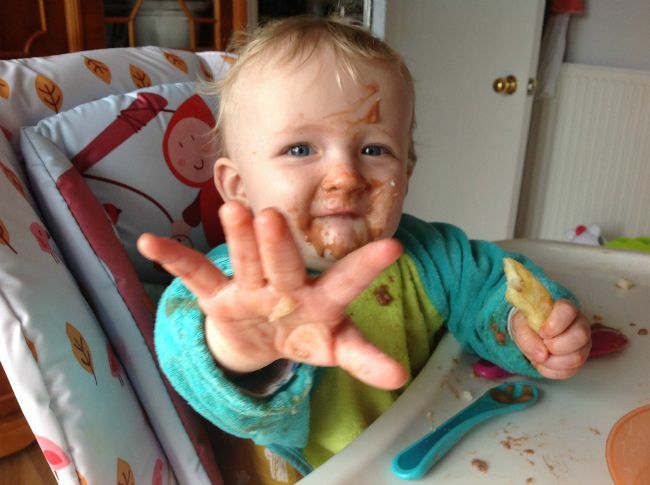 Essential for meal times especially if baby led weaning. A simple seat that attaches to a dining room chair is sufficient. We bought the Chicco Polly 2 in 1 Happy Land, it was on special offer and although the pattern is not really to my taste (see my review) when covered in chocolate dessert or yoghurt they all look pretty much the same. 3) Coveralls and floor cover. Again to minimise mess when Bear feeds himself. He loves to decorate the dining room and himself so these have saved me hours of work. 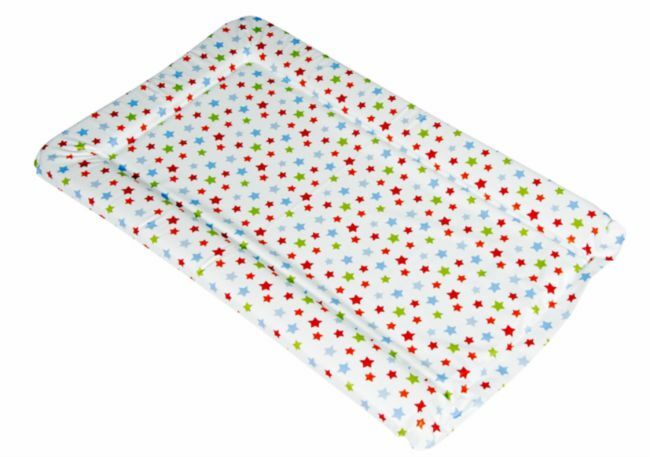 I bought the Mothercare coveralls and from Aldi's a nylon table cloth designed for outdoors that I use to cover the floor. 4) A buggy/pushchair. To save transporting Bears pushchair back and forth when there's so much more to worry about we bought a cheap buggy. 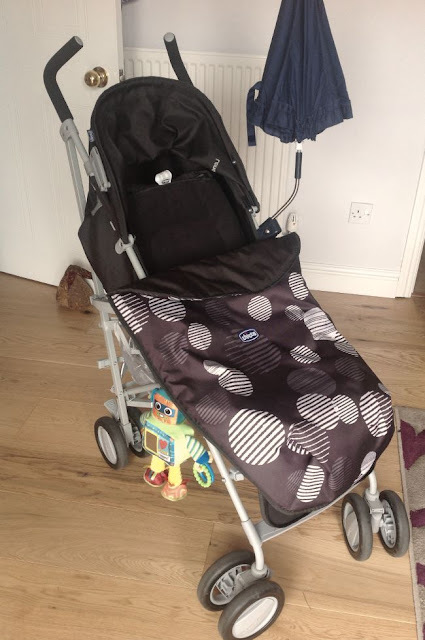 We bought the Chicco London stroller from Mothercare when they had it on special offer (I should have shares in this company!). OK it is basic but if you can get it when on offer it's a bargain (see my review). 5) A change mat. Any will do they are cheap and colourful. Ours is the Red Kite stars from Asda. Other than protecting surfaces and having somewhere cushioned to lay Bear, it is also a reminder for him to lay still (oh yes he does!) whilst being changed. Lay him down on any other surface and he will roll over, crawl away or cry. 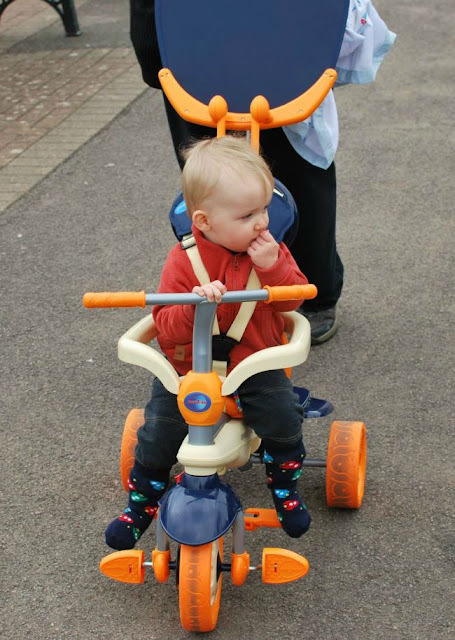 6) A Smart Trike. I love it, Grandad loves it, Bear loves it! Number one essential luxury for us. Again we weren't concerned about colour/design so bought the Vanilla 4 in 1 blue and a rain cover which we haven't used yet. 7) A car seat. This is essential if you want to get out and about. 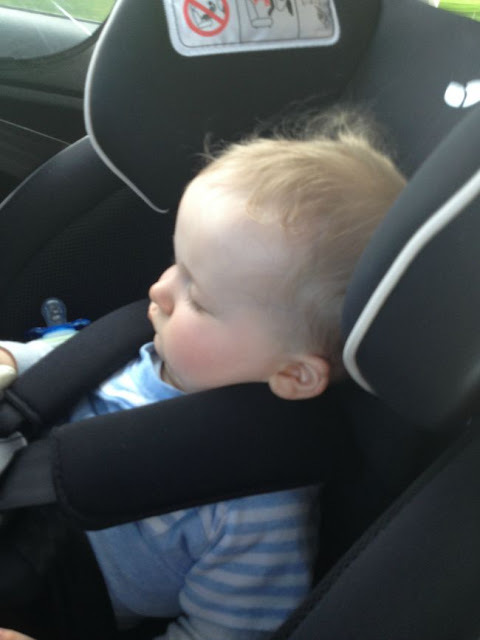 We didn't want to have to fiddle about taking his car seat out of daddy's car every day. We bought the Joie stages group 0+,1 and 2 when it was on special offer (another bargain from Mothercare). There is lots of advice on the internet for buying a car seat. 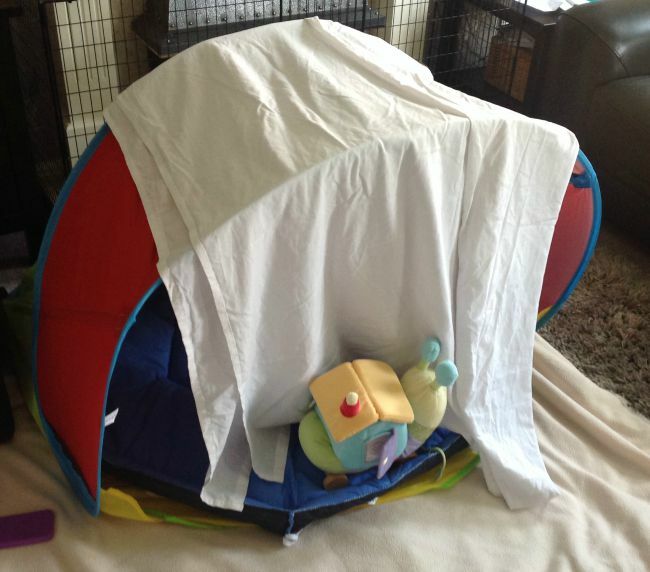 8) A play tent. 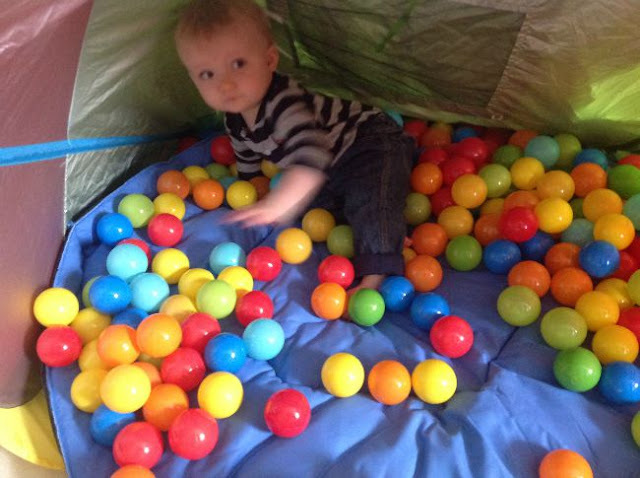 We bought ours from Tesco, needed some tweaking to get it to work but Bear loves it as a den, hopefully summer will come to South Wales and we can use it in the garden (see my review). 9) A fire guard. Why not higher in the list? 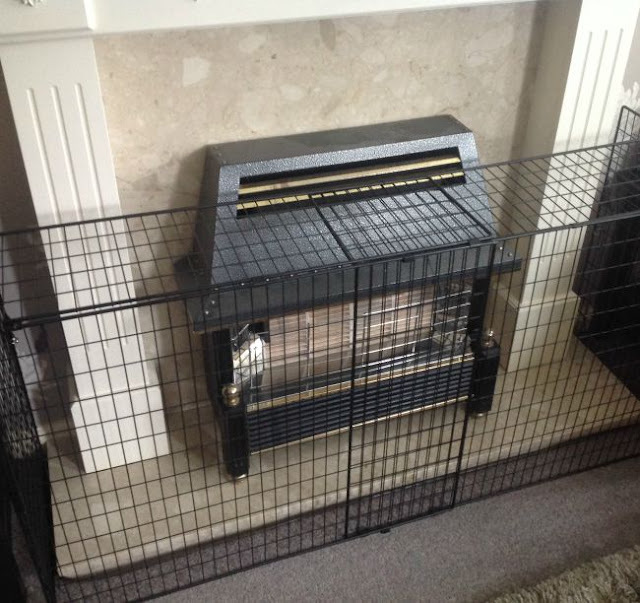 Well we have a gas fire and very rarely have it on. We use the radiators to warm the house but Bear kept banging the fire and playing with the decorative bits. Also it has a raised marble hearth that I was worried he'd fall and crack his head on. Pillows etc did not deter him but since the fireguard has been in place he has mostly ignored it. 10) Wine. After our 3 days of childminding, on a Wednesday evening, Grandad and I like to reward ourselves with a glass or 2. Cheers.